If you have been to a high-end restaurant lately, you may have noticed the tiny little greens used to garnish your meals and soups. Microgreens, as they are known are gaining rapid popularity for their intense flavor, rich color, and dense nutrition. Small is the new big! These juvenile plants should not be confused with sprouts. While sprouts are germinating seedlings, microgreens are plants that are harvested at their cotyledon stage, when they are immature, with the baby set of 2 new leaves or the next set of 2 to 4 leaves, and just a few inches tall. Technically, any green vegetable or herb harvested at this stage becomes a microgreen, but as is always the case, there are a few that shine (in terms of nutrition value) above the rest. Although, the nutrition profile of a microgreen depends on the type of plant it originates from, any microgreen still provides concentrated nutrition and flavor that is between 4 to 40 times higher than its adult counterpart. Many microgreens are richer sources of beta-carotene than carrots, containing 12 mg per 100g as compared to 8 mg in boiled carrots. Cilantro microgreens have three times more beta-carotene than mature cilantro. In fact, they are the richest sources of beta-carotene, carotenoids that are vital for reducing health risks like cancer and glaucoma. Vitamins C, K, and E are highest among red cabbage, garnet amaranth, and green daikon radish microgreens. For instance, red cabbage microgreens have 40 times more vitamin E, 6 times more vitamin C, and 69 times more vitamin K than mature red cabbage. All these vitamins are important for the skin, eyes, and for fighting cancer. Cilantro greens are the richest source of lutein and zeaxanthin with 11.2 and 28.6 times greater concentrations than their mature counterparts. Lutein is beneficial for eye health, helping to ward off macular degeneration. Cilantro ranks second in violaxanthin with 5 times more concentration than their mature counterparts, and 2.8 times more than mature spinach. 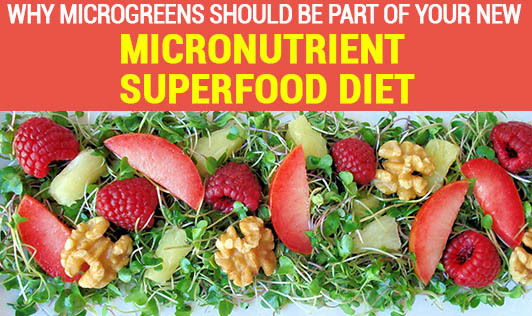 Simply put, microgreens are flavor bombshells, vibrant in color and nutrient-dense in nature. And the best part, they are as inexpensive as they get. You wouldn’t need to purchase them in a premium, organic food store. All you need is a small kitchen space to grow your very own herb garden.